my #StartFreshii Juice. Cleanse. Energize. experience! when the #StartFreshii Challenge was presented to me, i finally decided to take the plunge! 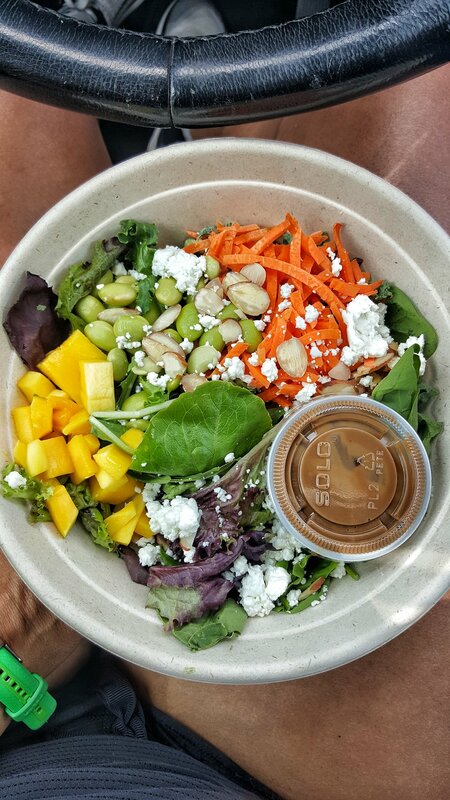 i love Freshii cause they offer a variety of healthy, nutritious, fast-food items for people on the go. i just wish they had a drive through! the decor is fun, bright, and contemporary, and kid friendly items make this the perfect healthy family eatery. again i did the 1 day, but if you decide to give this a whirl yourself, you've got 3 or 5 day options too. pick the one that best suits your lifestyle and schedule for best results. i ordered some oatmeal for the boy's breakfast. adorable presentation! and i am thrilled they both love oats so much. my eyes!! i was LOVING all that beautiful, healthy color! the smoothies were labeled and to be consumed in a certain order every 2.5-3 hrs; the detoxifying Metaboost salad was to be eaten at the end of my day. staying busy between meals was going to be key in getting me through this! we explored the city a little before running errands. one of the calming fountains at a small, contemporary park just down the street. the sun was out but thankfully there was still a nice breeze at 10am! so Chiso got to run around and play a bit as i finished up juice #1. i sipped all of them suuuuuuuper slow. Q: what is THE very first thing that pops into your mind when you read that question? comment below. A: before i die...i want to live out and fulfill His purpose for my life. that's #1. i will remember and cherish these days forever!!! so grateful to be able to do what i love with the people i love. after that, errand time. running around in the Texas heat and jumping in and out of the car with kids is a workout in itself. whew. i said all that to say that at 2pm, i cracked. lol! keeping it real! i'm used to eating over 2k cals a day so i was really going through it at that point. i just hope there was nobody sitting in their car watching me tear this salad UP. wasn't it pretty though? after that, i felt like i could actually finish this thing strong. 3rd juice done with one left to go as we finally headed home. you're supposed to drink 8-10 glasses of water in between 'meals' when doing a cleanse as well. i did my best. by 6pm? DONE. finished a lil early, haha. the Freshii cleanse pamphlet did suggest that if hunger overtakes you, increase your water intake, drink a herbal tea, or reach for raw or lightly cooked fruits and vegetables. that said, i had grape tomatoes and half a cucumber before finally getting in bed around 10pm. the next morning i felt lighter, and my mid section's skin was noticeably tighter. that's what cutting out refined sugars does for me though, immediately. my tummy and waist are the first to respond when i tweak my nutrition. this was a mental battle more than anything! once i woke up the next morning with no pressure to stick to the cleanse, i wanted to keep going. go figure. great for resetting/restarting your system. i am now motivated to keep my refined sugar intake low and my raw fruit/veggies intake high. this is when i feel and look my best. not great as a lifestyle (possibly once a week at best) or for fat loss. the diet is already low in protein and calories and the body goes into starvation mode after a while which conflicts with the fat burning process. unless you have your own juicer at home and get a great, cheap deal on produce, juicing can get rather expensive. fyi! many times the media choses to focus on the short-terms results produced by these cleanses. know that your results won't last if you don't make it a point to move more and maintain and healthy, low-no processed diet. i highly recommend you accept the #StartFreshii juice cleanse challenge! all 4 juices are delish and refreshing but my fave was definitly #1. tell me about your cleanse/detox experience below.